Volunteers are great and NHW has a lot of them. The more active we can get our volunteers the stronger NHW will be, so here are some tips to softly encourage active engagement! Ask your members what skills they have and what they would like to do. Ensure there are many opportunities for your members to get more involved. Allow volunteers to work around their other commitments – accept NHW may not be their number 1 priority. Provide opportunities for them to develop their skills through training events. Ensure there is an enjoyment factor to all that you do – socials are a great way to achieve this. Thank your volunteers and show your appreciation regularly appreciation in different ways. Volunteers that are good at looking at an issue they want to change, and making it happen. For NHW this could mean anti-social behaviour in an area, poor parking, or any other issue that is blighting the locality. Issue specific campaigns are a great way to mobilise people and gain new members. 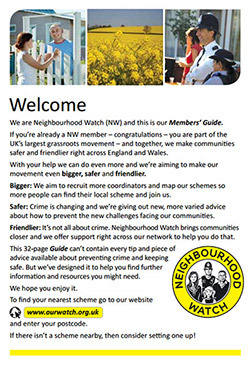 Volunteers have led full lives, and may have specific expertise in some areas that would be useful to NHW membership, such as Domestic Abuse, Drugs, Anti-Social Behaviour, or vulnerable adults. These specialists could help advise and also have input to creative campaigns. Although it is said no money is needed to run NHW, it is needed to help broaden engagement to put on events, run campaigns, and create publicity material. Having a volunteer who has fundraising experience will help areas raise their own money to be more visible in the community. You are all doing great work and you must let the world know about it! In this day and age there have never been so many channels through which to market your work. There may be a volunteer who has a marketing background who can help write press releases and improve social media presence. Having someone in the local scheme whose primary job is to look after the more dormant membership and welcome new members is a good idea. It helps give that personal touch and a single point of contact should people want to offer their skills to get more involved. Events are great for getting the whole community involved, for raising the profile of NHW, and for broadening awareness of what you do. Having a volunteer in charge of event organisation will mean you get more done, and have some great content to get some press coverage too! Having a volunteer whose role is to reach out to community groups and organisations will help ensure you are taking into account the whole of your local community. This is a key part of broadening engagement and building relationships with other agencies will help you in a number of ways.